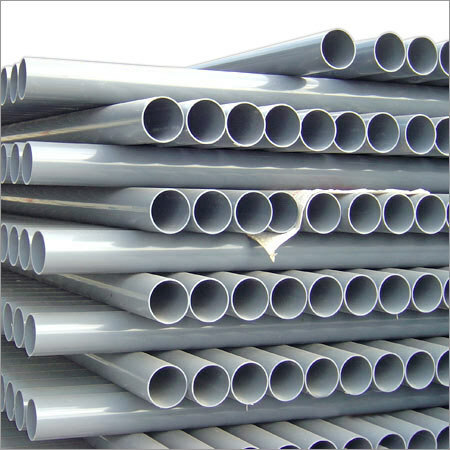 Plastic, vinyl, PVC, and uPVC are all used almost interchangeably by most of us. Vinyl window frames are plastic. That’s right- plastic. But not all plastics are created equal. 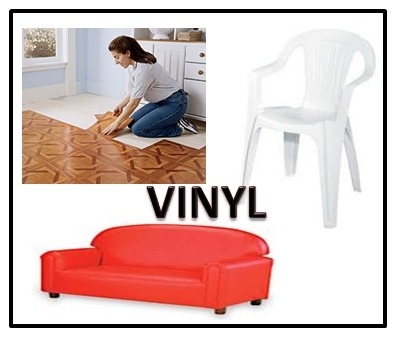 Think of the things you know as vinyl, like the stuff that looks and feels pretty much like leather, vinyl porch furniture that is flimsy and gets killed with the Florida sun, and even vinyl flooring. Plastics are everywhere- and we think of all these as completely different products, but they are all some kind of plastic, items with astoundingly different qualities. Your car probably has plastic bumpers. 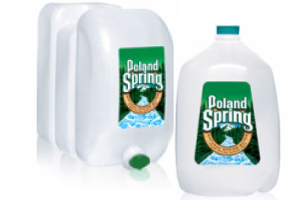 The plastic used there certainly is different than the plastic in the bottle of water you buy. In the 1800’s when vinyl chloride was unintentionally exposed to sunlight a white solid substance was discovered. It was PVC. Attempts to use it in commercial products failed because of the properties. It was rigid and difficult to process. In 1926 B.F. Goodrich found a way to plasticize it by blending in various chemicals. Its flexibility and varying compounds made it a huge commercial hit. Now its variations are everywhere. Most vinyl window frames are made of uPVC or the unplasticized version of PVC. That’s what the “u” stands for. Guess what. All uPVC is not created equal either. Take a look at the “Replacement Window Warranties” article on my site here. 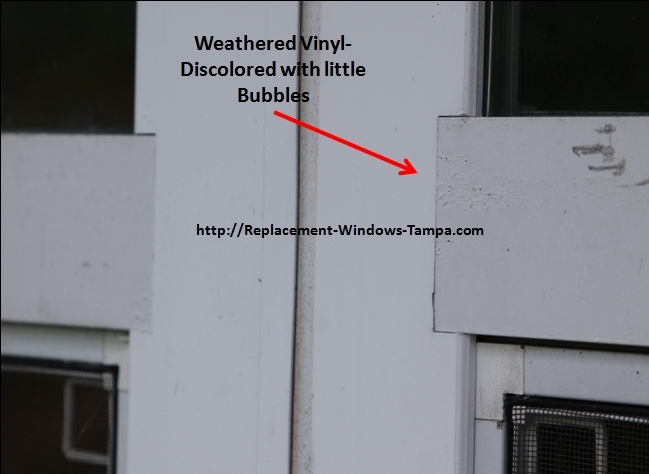 Many manufacturers, especially those who sell the same window up north as they do in Florida, exclude covering weathering. 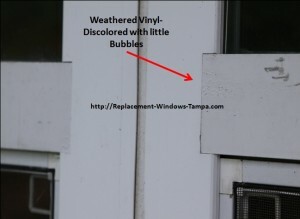 They say weathering is normal with vinyl window frames. But more and more you can find plastics in products that stay outside every day, even in Florida. Some weather, some don’t. That should tell you that there are chemical components that can be blended into plastics to reduce or even eliminate weathering. So why wouldn’t all outdoor plastics be made to resist or eliminate weathering? One word- Cost. Could those cheap plastic outdoor chairs be made so they didn’t get chalky and pitted in six months in the sun? Sure, but would you pay two or three times more to buy them? How about ten times, would you pay that? Maybe as a Florida resident you’d pay that extra money, but why would someone buying those chairs who lives in Indiana pay more. Up there those chairs last for years. The folks who manufacture those cheap chairs are not going to make a special blend just for the Florida market. They sell them everywhere. That is exactly the issue with many window manufacturers. They sell the same window across the country. Why retool or reblend for Florida? Compared to the entire United States, Florida is a drop in the bucket, so they don’t retool or build specifically for us. 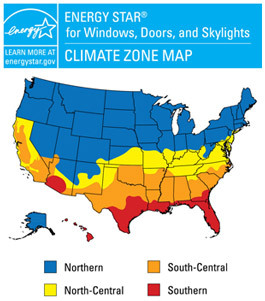 Look at the Energy Star map. The red area is not where the largest populations live. Now we have another dilemma. Window manufacturers who started in Florida and have branched out into the up north markets cannot use the more expensive uPVC blends and hope to compete in the rest of the US with all the companies up there, so they don’t add those expensive chemicals that will resist weathering. Their vinyl window frames weather just like other windows. If you are buying replacement windows with vinyl window frames, you’ll get non-conductive window frames. If those frames are enhanced with foam, your windows will insulate better and conduct less sound. If the uPVC has added inhibitors that reduce or virtually eliminate weathering here in Florida, you are getting a superior product, and you won’t see weathering excluded in the warranty. If those frames have metal reinforcement in their meeting rails, you’ll have less susceptibility to bending and screws will not pull out. If that metal is aluminum rather than steel, there will be no rusting inside your sealed frames. But to get all these benefits, you will likely pay more to get more. Yes, you get what you pay for. There are times when old windows were removed very carefully and are offered for sale. You may be able to get parts from these and use them to repair what you have. Repairs do not need to be permitted or be up to current building codes.